R.U.R. (Russum's Universal Robots) is a "play" written almost 100 years ago and first introduced the world to the word "robot" which was derived from the Czech word "robota" meaning serf labor or hard work. ?apek has actually credited his brother (the painter and writer Josef ?apek) as the actual inventor of the word. In this fairly short story the robots themselves are more like artificial humans than what we now define as a robot, blending in with their human counterparts seamlessly and clearly very intelligent. It's probably the only actual play I have read since leaving school all those years ago and that in itself was an interesting experience. The play format does work better than I imagined it would, partly due to the short length, I really couldn't imagine a whole novel would work as well but here it's different enough to be enjoyable. The story is quite imaginative and it feels almost like a snapshot of life in the 1920's with a very distinctive dialog and strong voice. I can see why it's often considered to be one of Sci-fi's most important plays and deals with the pressing issues of the time such as exploitation and forced labor. The quality of the writing is exceptional however it does feel a little dated and the ending a little clichéd, although we should remember that it probably felt pretty fresh nearly a 100 years ago. 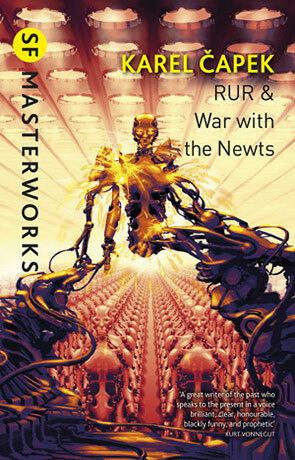 War with the Newts is the second dystopian story on offer here, much longer and not written as a play it does still retain some of the same feeling and satirical outlook along with the incredible quality of the prose and clever use of satirical elements. Set against the rise of Nazism (War with the Newts was written in 1936), mankind discover a new, intelligent, sea dwelling race of salamander living in the Pacific ocean. As you might expect this race is quickly and ruthlessly exploited and enslaved however eventually the Newts learn as much as they need to rebel against their captors hence the title "War with the Newts". It isn't until close to the end of the story that the titular war actually breaks out and much of the novel deals with the discovery, exploitation and evolution of these creatures. There isn't really any one central protagonist in the novel; instead the plot focuses on a wider social perspective, told from a number of different viewpoints. As this is a satire - and a quite dark one at that - the book is essentially a social commentary on the European politics of the time including the most obvious fascism and Nazism but also the segregation in America and the arms race overall. Given the additional length and change in format, this story is a lot more subtle than R.U.R. while dividing the book into three distinct sections manages to provide nice break points. The first section deals with the discovery of said Newts and the reaction of humanity. The middle of the novel is almost entirely devoted to a sort of parody of human history, told with an incredible amount of ingenuity. The last part deals with the war itself with the Newts themselves used as a parallel to the Nazi rise. These two stories are both deserving of being in anyone's collection for very different reasons, R.U.R. is a part of our history and should be enjoyed as such while War with the Newts has some incredible messages that even now resonate with the reader. Written on 25th November 2011 by Ant.